After reviewing it for a few minutes late yesterday morning, I posted a tweet noting that under the ACA, a 60-year old earning about 300% of the Federal Poverty Line...roughly $37,000/year...only has to pay up to around $3,600/year in premiums for a Silver plan (9.69% of their income)...but under BCRAP, that same 60-year old would have to pay up to $6,000/year for a Bronze plan (16.2% of their income). The tweet went viral...I think it was retweeted like 1,000 times or so over the next few hours. Several hours later, I realized to my embarrassment that I had made a basic, but important mistake: I was looking at the final income percent for the 300-350% range (16.2%), which applies to those at 350% FPL, instead of the initial percent (11.5%) for 300% FPL. The actual maximum premium at $37,000 would be closer to $4,260/year (11.5% of income), not $6,000. Still much uglier than under the ACA, but not that ugly. Unfortunately, by that point the original tweet had gone pretty viral...whereas the correction has only been retweeted 6 times as of right now, and has only been viewed by a few thousand people. Still, I hoped that this would be the end of it since I had deleted the original. Actually I deleted that tweet (or thought I did). It’s actually up to $4,200 at $37K or up to $6,800 at $42K under #BCRAP. Still ugly. ...I see that Rattner's tweet has been retweeted over 400 times as of this afternoon. The bill’s prospects are uncertain. It creates plenty of losers. Notably, the old could be charged up to five times more than the young, up from three times currently. The idea is to encourage more healthy young people into the market. But it will create pain for older buyers, especially some middle-earners who stand to lose their subsidies. Currently, these go to all those who earn less than 400% of the poverty line ($47,550 for an individual). The BCRA cuts this to 350% (about $41,600). Charles Gaba of acasignups.net, a number-crunching website, estimates that a 60-year-old earning $37,000 would go from paying roughly $3,600 a year for a silver plan today, to paying roughly $6,000 for a bronze one, under the BCRA. If I'm reading the table correctly, under the BCRAP bill, a 60-year old earning $37,000/year would pay up to $4,200/year in premiums for the benchmark Bronze plan (around 11.5% of their income) before any financial assistance would kick in, vs. paying up to $3,600/year for the benchmark Silver plan under the ACA. 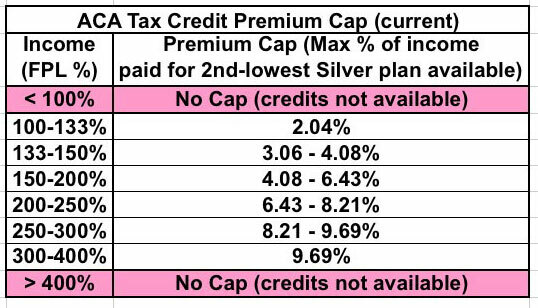 If the benchmark Bronze plan costs, say, $5,000/year at full price, they'd receive around $800 in tax credits, while they wouldn't receive anything if the full price was lower than $4,200, whereas under the ACA, if the benchmark Silver plan cost $5,000/year, they'd receive around $1,400 in credits, and so on. None of this has anything to do with deductibles or co-pays, of course, which would also be worse under BCRAP than the ACA, but I'll leave it there for now. I apologize to everyone for my error and will try to be more careful in the future. P.S. While I'm at it, speaking of corrections/clarifications: I was also one of those who retweeted that "Mitch McConnell had polio as a kid and had his expenses covered by the government" meme yesterday.In my tweet, I stated that I didn't know about this and confirmed it, with a link to a PBS interview with McConnell from a few years back in which he mentioned having polio as a kid. The Warm Springs center that helped in Mitch McConnell’s recovery was indeed founded by Franklin D. Roosevelt, who was President at the time McConnell was struck by the disease, in 1944. Roosevelt was the driving force behind both the Warm Springs Foundation and its successor, the National Foundation for Infantile Paralysis, and used his political office to energetically promote fundraising for polio care and research. The funding came from the kindness and charity of the public, as well as wealthy celebrities and large corporations. However, it was operated as an innovative, nationwide nonprofit organization, not a federal or state agency, and it was not taxpayer or government-funded. The Warm Springs center visited by McConnell remained owned and operated by a nonprofit organization until 1974, when the state of Georgia took it over, making it truly government-run. Since 2014, it has been owned and operated by Augusta University. Of course, McConnell did go on to join the Army for a stint, and has been either an Assistant U.S. Attorney General, a County Judge or a U.S. Senator since 1975, so he actually has had his healthcare paid for by taxpayers for the past 42 years...but no, his childhood polio treatment was not paid for by the federal government. I've since deleted that tweet as well.